Ask any Ethiopian about their country's history and they will proudly recite the many historical facts of their ancient nation. Ethiopia indeed has a history that goes back thousands of years, but there is a reason why Ethiopia is what it is today. Ethiopians have the right to be proud of their ancient nation's history. It is a country that has many "firsts" and "onlys". For example, it is the first and only African country that put a definite end to a colonizing European country's efforts. The following list contains 25 of the most important people in Ethiopian history. Among the 25 historical figures that are presented here, there are heroes, emperors, empresses, kings, queens, and much more. 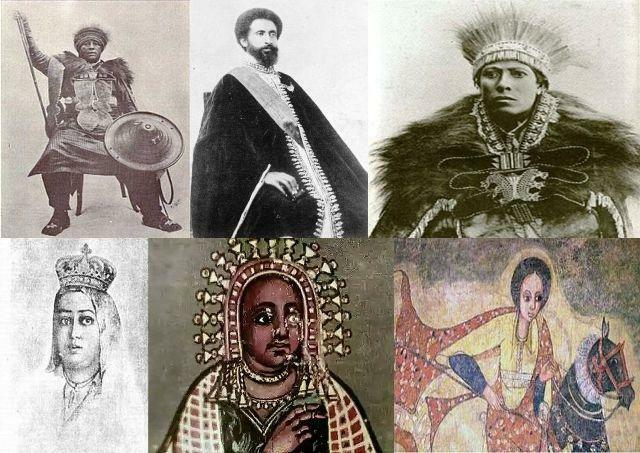 Without the actions and deeds of the following heroic people; Ethiopia today would be one that would be unrecognizable by the modern inhabitants of this land. Directly or indirectly, each and every one of these people has contributed to the greatness that is Ethiopia. Ethiopia served as a national interface between the two eastern superpowers of the time - namely Byzantium and Persia. The Aksum-based emperors of Ethiopia at this time were also very eager to establish a link with their long-time Christian counterparts in Greece and Istanbul (modern-day Turkey). The British made him the Commander of the British Military Police and sent him to Germany to fight against the German Army. He battled with the German Nazis in different cities, defeated them, controlled the cities and villages, and entered Berlin triumphantly again waving Ethiopian and British flags. Mikael of Wollo (1850 - 8 September 1918), born Imam Mohammed Ali, was an army commander and a member of the nobility of the Ethiopian Empire. He was the father of the "uncrowned" Emperor Iyasu V.
Seyon prepared for his invasions by transforming the imperial army shortly after he came to power. Mentewab rose from these origins to become one of the most powerful women in Ethiopian history. Born with the name Kassa Hailu, Tewodros II took a throne name equivalent to the English name Theodore. He was one of Ethiopia's most notable emperors, being revered by modern Ethiopians as the first modern leader and the man who unified the various kingdoms into one empire. Makeda, as she is known in Ethiopia, ruled over the land of Sheba or Saba, an ancient kingdom situated in modern-day Yemen and Ethiopia. Despite many aristocrats' resentment at the young Alula's favor with the emperor, the new general proved his worth. 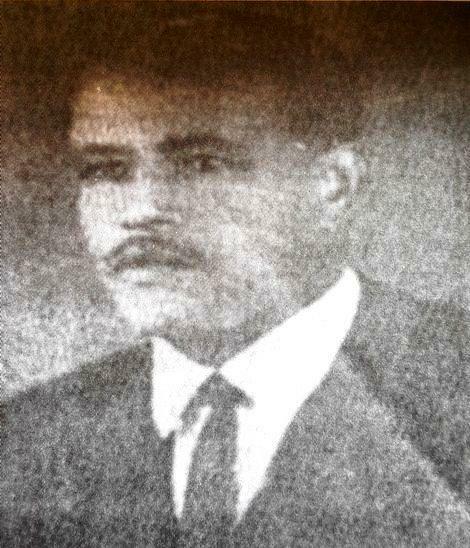 Restored to his capital in World War II, he obtained for Ethiopia a coastline on the Red Sea. Despite the anachronisms of his person and the archaicisms of his country, he emerged as an elder statesman of African anticolonialism. He lays claim as being the last King of the Kingdom of Wolayta. Many believe he was one of the most skilled warriors and the most powerful king of Wolayta. Sensing a shift in power, Negus Tekle Haymanot Tessemma negotiated a defensive alliance with Menelik. After Menelik secured Gojjam and Begemder, Yohannes ordered him to return to Shewa. In September 1888, when Tekle Haymanot Tessemma refused to contribute forces to the efforts of Yohannes against Mahdist who had re-entered western Gojjam, Yohannes suspected Tekle Haymanot and Menelik of plotting against him. To destroy the power of Tekle Haymanot, the army of Yohannes laid waste to much of Gojjam. In 1889, she collaborated with Emperor Minilik to establish Addis Ababa as the nation's capital. And it was Taitu who gave Addis Ababa its name. His attempt to use religion as the basis for unity ignited resistance, particularly from Muslims who were ordered to build churches, pay tithes, and eventually be baptized. After the Egyptians had advanced into Ethiopia, Emperor Yohannes drew them into battle and beat them resoundingly once at Gundat in 1875 and again at Gura in 1876. 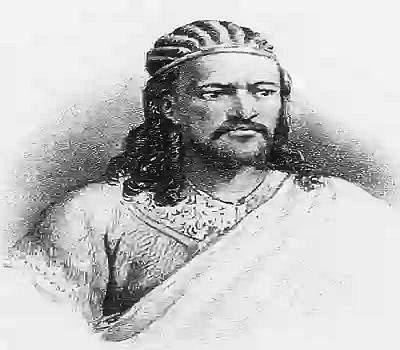 Emperor Tewodros II's wife, Empress Tiruwork, and his young son and heir, Prince Alemayehu, were captured and order was given to take them to England. Empress Tiruwork died on the journey to the coast and was buried at Sheleqot Monastery in the Tigrai province of Ethiopia. Prince Alemayehu made the journey alone but grew increasingly lonely in imposed exile in England.